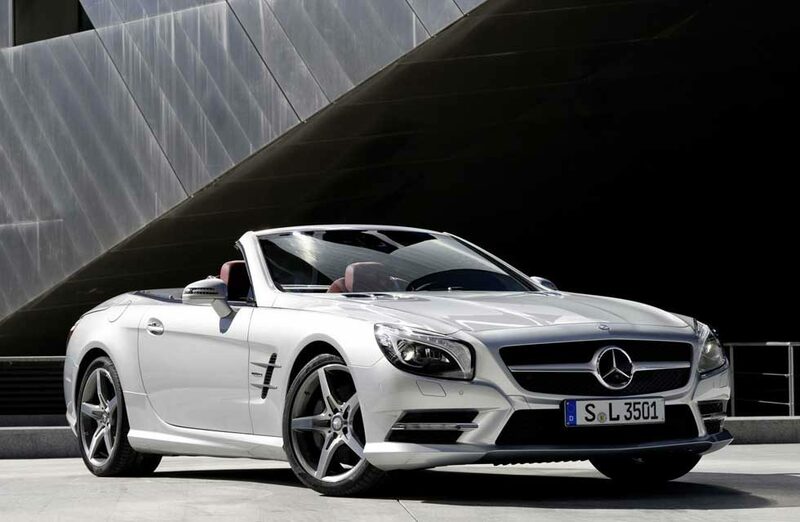 The 2013 model year marked the introduction of the 6th generation SL Class roadster from Mercedes Benz. A new SL is always a big occasion and the car always has big shoes to fill, as the SL class roadsters are arguably the most iconic of all Mercedes-Benz cars since the introduction of the 300 SL gullwing in the mid 1950s. The 2013 Mercedes SL 550 arrived with an entirely new body style, engine and all kinds of new technology packed into its mostly aluminum body shell. 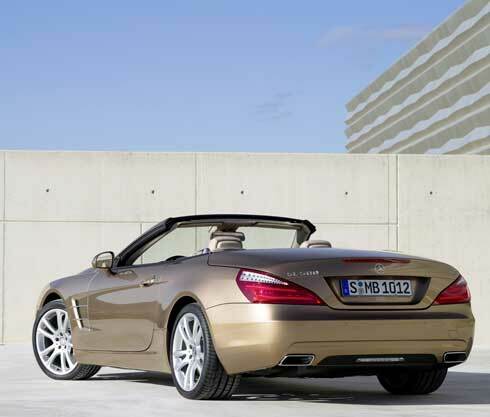 This article will focus on the 2013 Mercedes SL 550 model specifically. We’ll explore the optional equipment, option packages, color choices (exterior and interior), wheel options and prices of each. We’ll also explore different ways a 2013 SL 550 my have come equipped from the factory. By knowing what was available on these cars when new and how a specific car could have been ‘built out’ by its original owner, potential buyers of a used 2013 SL 550 will be better informed and able to make good decisions when considering a car on the used market today. The 2013 was equipped with Mercedes (new for the time) 4.6 L Bi-Turbo V8 engine with direct injection producing 429 horsepower and 516 lb-ft of torque. 0-60 mph was reached in 4.5 seconds, not bad for a car weighing just under 2 tons. 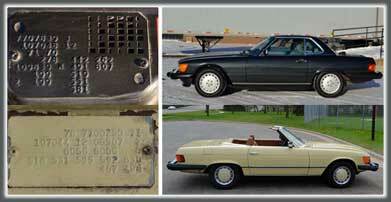 The SL Class cars are one of the few Mercedes classes that don’t carry an up-charge for metallic paint. 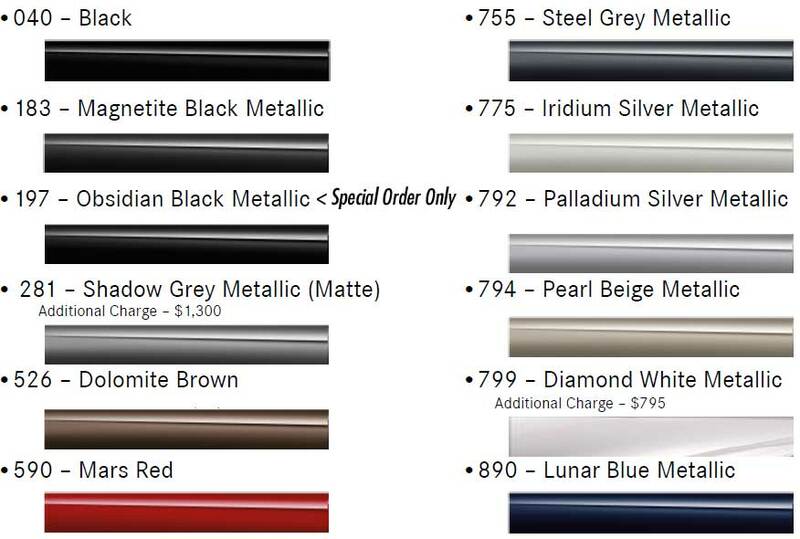 A 2014 M class SUV, for example, had a surcharge for metallic paint of $720. SLs are already $100,000+, maybe Mercedes doesn’t see the point in dinging their customer another $700+. There are a couple of exceptions however. The matte color, Shadow Grey Metallic and Diamond White metallic both carry additional charges on 2013 SL 550s. One note, Dolomite Brown was not available until the 3rd quarter of 2013, so any car in that color would most likely have been built during 2013. Many 2013 model year SL 550s were built in 2012 due to model year introduction schedules. Being one of the higher end Mercedes-Benz models, the SL 550 comes standard with leather interior, as opposed to MB tex, found on the E class, M class SUVs, etc. 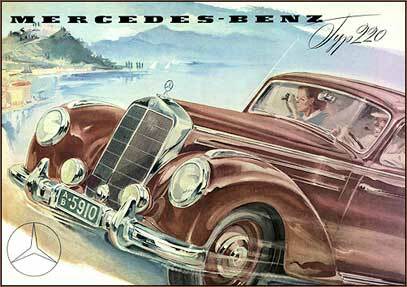 (Learn about Mercedes’ proprietary faux leather – ‘MB tex’ – and its long history here on Mercedes-Market). So what’s the difference between Standard and Premium leather? Even in these small photos you’ll notice the stitching / panel pattern on the seats is different. 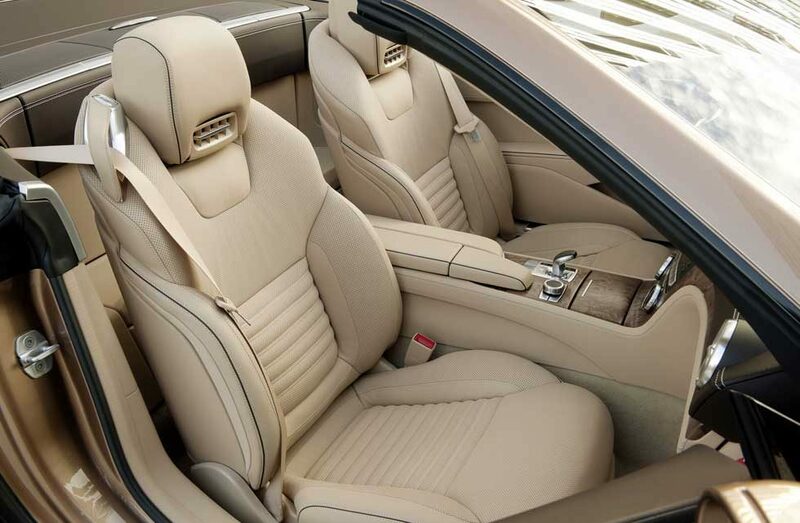 The Premium Leather interior is a bit more intricate, the seats are piped – sometimes in a contrasting color – and the leather is of a higher quality, it feels a little different to the touch. There were four interior trim options for the 2013 SL 550 (at right). Burl Walnut and Black Ash were the standard trim choices, although there was no additional charge Brown Poplar or Aluminum. Got get either of those, it would probably be a matter of ‘building the car out’ / ordering a car to your specs, although Poplar and Aluminum could be on regular cars delivered to dealerships at Mercedes’ discretion. Mercedes builds most individual cars themselves, without the input of customers, in other words, most customers just buy a car that’s sitting on the lot, even an expensive SL. So Mercedes builds cars in all kinds of configurations for general consumption, so while one trim may require ‘special order’ it’s entirely possible that Mercedes might just build one with that trim and it be delivered to regular dealer inventory. 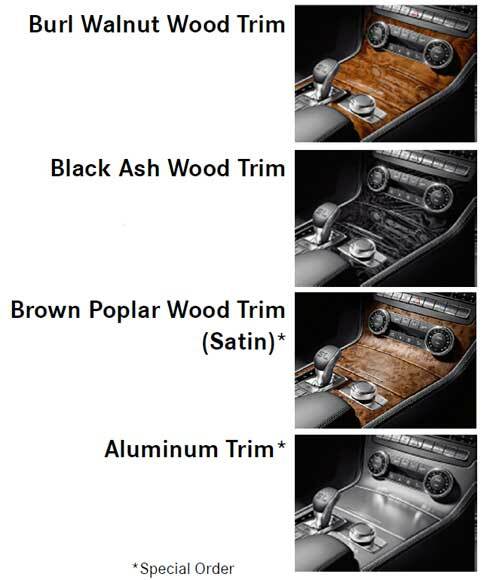 Most 2013 SL 550 models that I have seen have been equipped with the Burl Walnut option. There were 5 wheels options available for the 2013 SL550 as seen below. There are some additional photos of the 2013 SL 550 below. I have logged hundreds of miles behind the wheel of a 2013 SL 550. They are fabulous cars. I must admit, I wasn’t crazy about the exterior styling initially, but this new design has really grown on me, but it’s the driving experience that really won me over. Amazingly, it is light years ahead of the previous generation SL, a car which I loved, but this new one is amazing. It isn’t a sports car, not like a Porsche or Corvette, it is much more refined than either of those… the Porsche being like a scalpel, the Corvette more like a baseball bat… both fast as hell. The SL 550 is so smooth, comfortable AND fast, it makes fabulous sounds too. They’re great cars to get in and drive across the country in complete luxury comfort. If you’re considering the purchase of a 2015 SL 550 (or any other Mercedes model for that matter) at a franchised Mercedes dealer you can ask them to print a copy of the ‘Original Window Sticker’ / original equipment option list. In many cases, especially with vehicles that are just a few years old, the original window sticker may be folded up inside the case that holds the owner’s manual and other books. If not, it can be printed from the Mercedes-Benz computer system installed at all dealerships using the VIN number. This way, you can look down the list of options, see the original price of the vehicle when new and see all the equipment it came with rather than trying to look over the car to figure out what equipment it has. 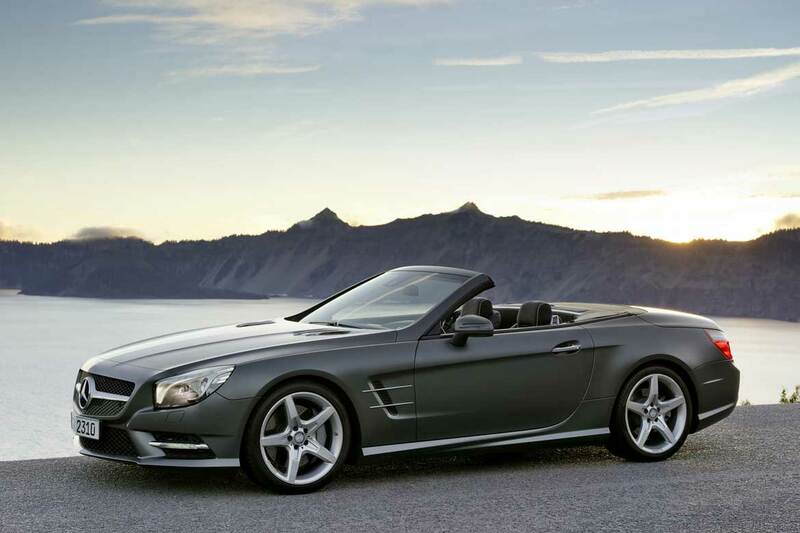 2013 Mercedes SL 550 – the 6th generation from Mercedes-Benz. 2013 SL 550 shown here with optional Premium Leather interior. 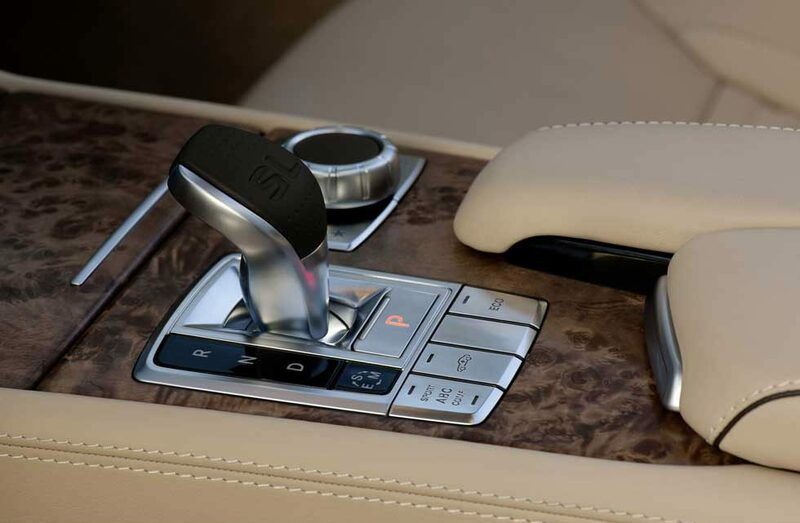 In 2013 the SL class received the same kind of shift lever as most AMG models replacing the previous generations’ more traditional ‘stick’ like gear selector. THIS WAS GREAT INFO , IM THINKING OF BUYING A 2013 SL 550 . Glad it helped Ken. It’s not always easy to find it all in one place. The 2013 models are great cars. This is truly helpful information, I too will be looking for a 2013 or 2014 SL 550. Thank you again very helpful information.